Garden Angels are joining forces with the Holy Dusters to prepare the Sanctuary and grounds for Holy Week and Easter. Pitch in to plant flowers, mulch beds, and give the Sanctuary a deep cleaning. Or help paint Abraham Station. Saturday, March 24, from 10 am to 2 pm. Come and go as fits your schedule. Children are encouraged to serve with their parents. Childcare available for youngest. Lunch provided. 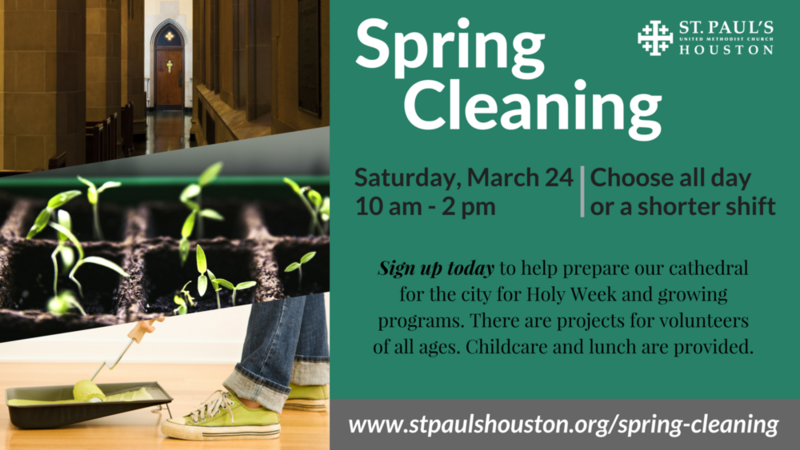 For more details and to sign up, please go to www.stpaulshouston.org/spring-cleaning or sign up on the Plaza this Sunday.